Rational value dominates our moral as well as our economic decisions today. What began as a theory examining financial data by mathematical applications turns into the contemporary default system by which goods are measured and value ascribed. While theologians along with many humanists have challenged this paradigm, very few have the acumen to analyze markets and to interpret financial data. Economist and theologian Mary L. Hirschfeld pioneers an informed investigation into the relationship between economics and theology. As a young, tenured professor of the former subject, she converted to Catholicism and found a fascination with the latter pursuit. Resigning from her position, she earned a second doctorate and now teaches both fields at Villanova University. Her rare combination of rigorous training at Harvard and at Notre Dame, respectively, enables her to bridge the gap between the "dismal science" and what was a millennia before proclaimed "the queen of the sciences". Thomas Aquinas blended the fresh Aristotelian influences of his 13th century scholarship with accepted Christian philosophy to craft an intricate expression of the manner by which invisible forces work within the visible realm towards completion. While Hirschfeld avoids preaching or proselytism, her goal remains grounded in the "flourishing" taught by Aristotle as the ideal good for humans. She critiques the reductive evaluation of worth to monetary levels and material acquisition. "For Aquinas, human choice is not about efficiently getting what we want so much as it is about learning how to want what is genuinely good." Virtue seeks "the good life in a distinctively human manner" rather than something sought as if "opposed to seeking the good life." The Greek concept of arête maximized potential, perfecting human nature, not merely gain. These concerns may appear erudite and irrelevant for our daily cares. Yet thanks to analogies to her cat Simon, and her childhood memory of hoarding candy rather than sharing, Thomistic teachings about the essence vs. the existence of God, and self-mastery as a discipline by which we act well, grow clearer. She incorporates the 2016 Wells Fargo scandal about employees pressured to create bogus accounts for customers so as to meet inflated sales goals to illustrate our "tendency to see the monetary aspect as primary" when it forces workers into "unjust" actions which prove not only exploitative but fraudulent. Similarly, Hirschfeld warns about the aggressive "marketing of products regardless of whether" they "meet genuine needs". This common situation shows how our culture has normalized an amoral view. Fundamentally, money presents a theological problem: it "tempts us to a false conception of the infinite, at least as it relates to our desire." Happiness is achieved not by accumulation but through the "sovereign good". The cardinal virtues familiar to Catholics (at least before Vatican II) include prudence. This orders life, in Aquinas' view, to a condition of Aristotelian fulfillment of a lasting good. This perspective may strike secular readers as anachronistic. But Hirschfeld turns to the common celebration symbolized by a Christmas tree. Under it, she reminds us, a tempting package promises to satisfy our longing. Once its wrapping is torn off and that gift is revealed, it may well turn out that its anticipated reward of sated, blissful contentment will remain unfulfilled. This attenuated yearning for completion in things keeps buyers rushing for a pile of shiny items for the next holiday season. The realization of happiness by ownership of goods proves not the true good, only an endlessly postponed will-o'-the-wisp pursued frantically on designated Black Friday or Prime Day shopping sales, always in the future. The escalating damage caused by infinite growth and selfish possession critiqued by Pope Francis in his 2015 Laudato Sì environmental encyclical, Hirschfeld demonstrates, hurts others, ourselves, and the earth. Discerning this frenzy in the 2008 financial crisis, she shows how "profit maximization" as the supreme justification for human action perpetuates avarice and covetousness, two other virtues often neglected. However, Hirschfeld understands that finger-wagging by a medieval thinker or a modern interpreter will not convince a skeptical audience which trusts only empirical data and upward bound earnings. She translates Aquinas' defense of private property into a balanced perspective including a "truly humane economic system". She aligns Thomistic caution on "greed for gain" among the emerging mercantile class of his time with relevant consideration for our embedded system of profit, production, consumption, and exchange. Both professors, old and new, agree that the capitalist norm exacerbates what evolved into a global obsession with status, amidst the fears of billions who fear dispossession. Hirschfeld steps aside to reveal a homely example of the mixed blessings of material goods. While the dishwasher machine may seem an obvious improvement easing labor and encouraging leisure, Hirschfeld reasons that its use may hinder as well as promote "the flourishing of the household" as to the bonding strengthened by shared domestic chores, and the intimacy increased within a family working together. Her nod to time-use studies done by Tibor Scitovsky supports her argument, but if she had updated its conclusions with a more-current-than-1986 domestic milieu relevant to our post-millennial inattentive and insecure generation (or two) enmeshed in screens beyond that of the television by the sofa, this would have boosted this stage of her thesis. Still, her apt reminders of the dangers of "maximization" remain telling. Hirschfeld may bog down in her earlier chapters on dense economic reasoning, but in her sections on the virtues, the pursuit of true happiness, and the relevance of Aquinas' incorporation of Aristotle's insistence on lasting fulfillment her perspective sharpens. She grasps how the manic imperative that the market penetration always deepens and the markets always rise widens the divide "between the income we possess and the material goods we genuinely need to live well." True, a professor assured of a lifetime income at an enviably secure rank and comfortable niche occupies her own status far above that of the vast majority of Americans, let alone billions abroad. Critics may chide Mary Hirschfeld as idealistic if not sanctimonious. She concludes by acknowledging the utopian tones of her corrective treatment of a precarious predicament for nearly all of humanity. She replaces the rational choice model with a framework orienting "economic analysis" within "a holistic act of happiness". That is, she integrates economic research into a "philosophic and theological discussion about the human good and human happiness." This knowledge may not be quantified in pie charts, by Wall Street, or within algorithms, but Hirschfeld insists that wisdom lies beyond the labs and the think-tanks. Her medieval and classical predecessors advised the pursuit of a higher order of thought and understanding; this endures for Hirschfeld as a more gratifying prize to acquire. 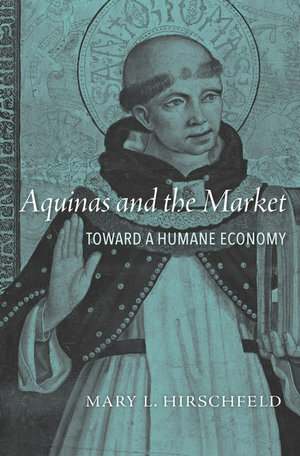 Aquinas and the Economy begins a necessary conversation between economic and theological sectors, in the academy and, one hopes, outside the ivory towers and seminaries, to calculate our ultimate worth.